What I love about lettering is the challenge of finding the sweet spot. You have to make each letter look unique, match the styles you're looking for, and there's only so far you can push a letter before it doesn't look like that letter anymore. The first time I remember becoming really invested in hand lettering was when I first joined Dribbble. I was looking through countless amazing lettering pieces. I guess I had never stopped to pay attention to the intricacy, the real beauty of that stuff. That was like the first true inspiration I ever had. That's when I decided to try my hand at it. I taught myself by studying other people's work, asking people questions... At first it was really tough. I'm an artistic person I guess, but I definitely wasn't born with the ability to do it. You have to fail so many times to get to the point where you are finally happy with what you craft. Finding something that I could focus on and really pour my heart and soul into that really resonated with people has just been one of the most rewarding and satisfying things I’ve ever done. It's just everything I could ask for. 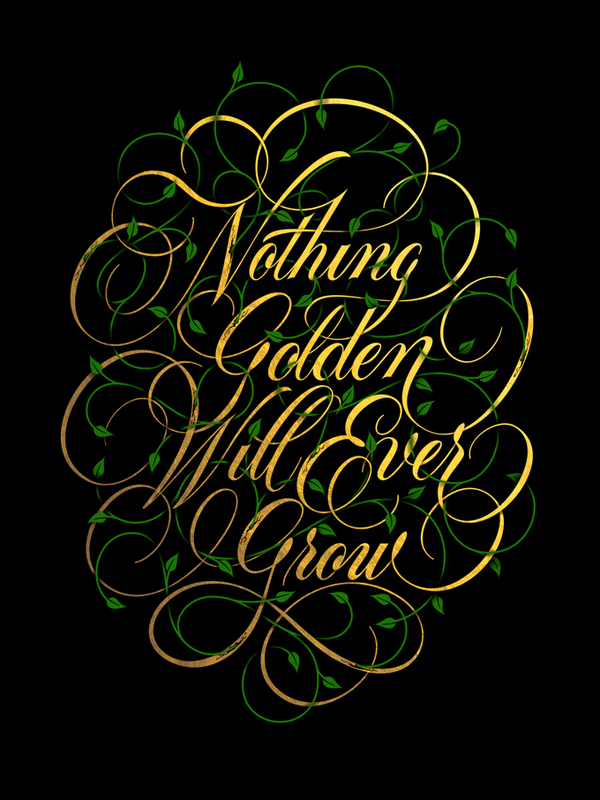 "Nothing Golden Will Ever Grow". Designed in April 2014 by Ryan Hamrick. Limited edition only available at La Crème de la Crème. PS: We think Ryan deserves it. Don't you?